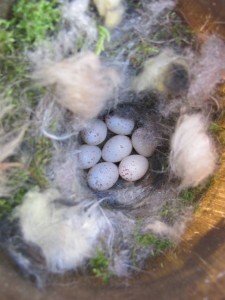 A number of other birds may also show an interest in the nestbox you have installed for the Bluebirds. 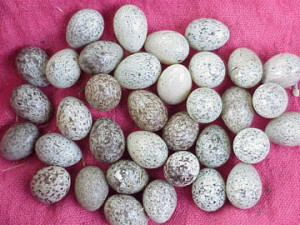 Some of these are very desirable native songbirds. 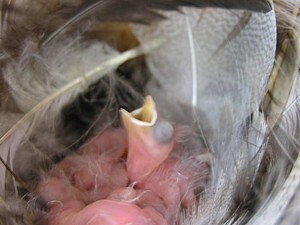 Others are either non-native invasives, or birds that may be dangerous to bluebird nestings. 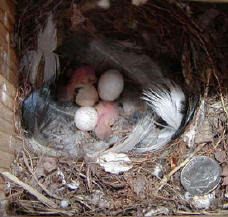 One of the most common of these is House Sparrows a/k/a English Sparrows. 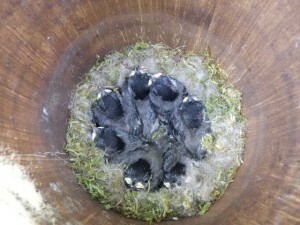 We’ve dedicated an entire page on this site to House Sparrows. 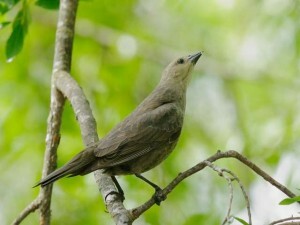 A small, brown, native bird with a beautiful song. 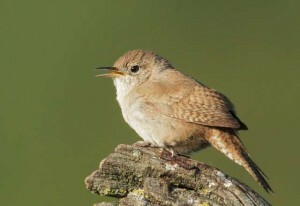 The House Wren can be a problem for Bluebirds, as it frequently fills several desirable nesting sites with twigs, but only uses one nest. 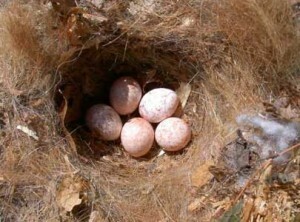 The unused nests are sometimes referred to as “dummy nests”. 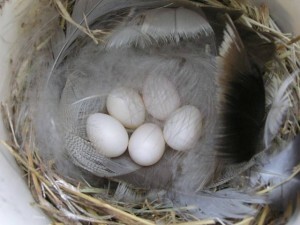 It has also been known to enter nestboxes where Bluebirds are nesting, pecking holes in the Bluebird eggs, or killing nestlings and removing them from the nestbox before attempting to fill the box with twigs. 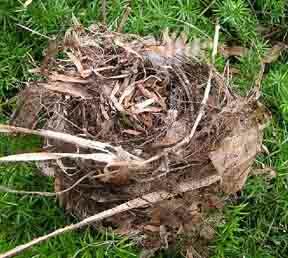 Being a native songbird, however, it is a protected species, and its completed nest and/or eggs should never be disturbed. 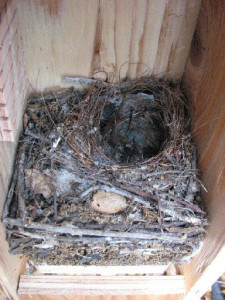 It is possible to discourage a House Wren from building in a specific Bluebird nestbox before the nest is complete by repeatedly emptying the box of the twigs that the House wren deposits there. 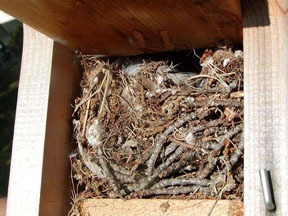 If there is not a completed nest with a nest cup, the twigs may legally be removed. The best defense against House Wrens is to place the Bluebirds nestbox in a fairly open location, at least 100 feet from densely wooded areas, as the House Wren prefers to nest in or near wooded land. 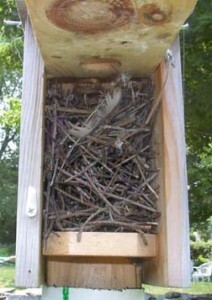 Some success has been reported with the use of “Wren Guards” on nestboxes.See Bob Orthwein’s 1996 report on Wren Guards. 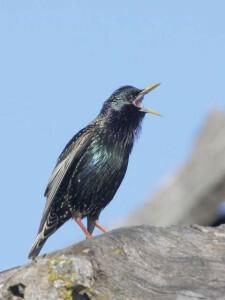 The European Starling (EUST) is a formidable competitor to Bluebirds in the wild; however a man-made nestbox with a 1 1/2″ opening will not admit a Starling. Starlings may still compete with the Bluebird at the mealworm feeder. 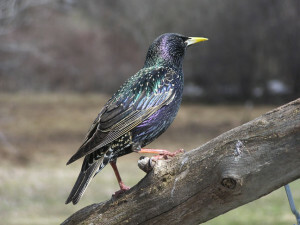 Several styles of feeders have been designed to discourage the Starling from entering. 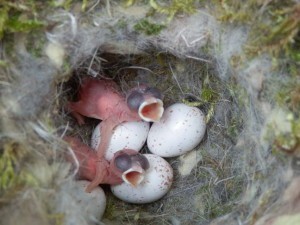 Please see the FAQ’s on Feeding Bluebirds for further information. 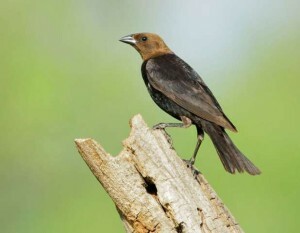 The Cowbird is what is known as a parasitic nester. 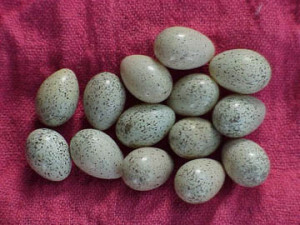 It builds no nest of its own, but lays its eggs in the nests of other species, then leaves the incubation, feeding and care of its young to the host bird. 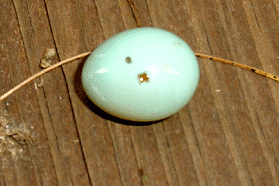 Often the Cowbird will remove one of the hosts eggs from the nest prior to laying its own. 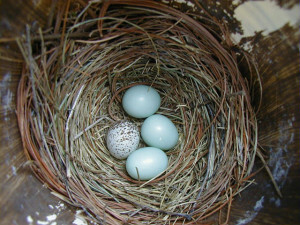 If a Cowbird lays an egg in a Bluebird nest, the Bluebirds may raise the Cowbird young at the expense of their own chicks. 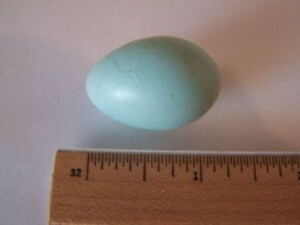 Check your State regulations regarding the legality of removing a Cowbird egg from a Bluebird nest. 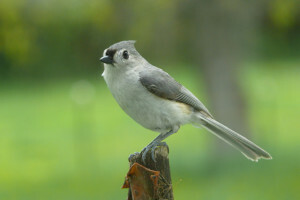 The Tufted Titmouse (TUTI) is a native cavity nester and a very desirable nestbox tenant. 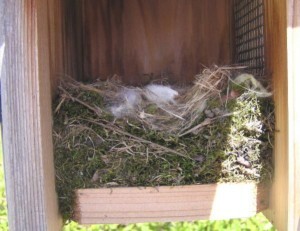 They may nest in Bluebird boxes, but they are able to use boxes with smaller openings. 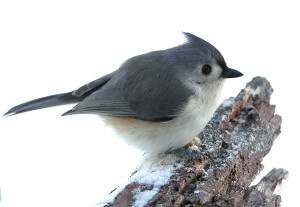 If you have Titmice and Bluebirds competing for a nestbox, the Bluebirds will frequently win because they are the larger bird. Often the best solution is to provide a second box, and place a hole reducer on the box the Titmice prefer to prevent the Bluebirds from interfering with their nesting. 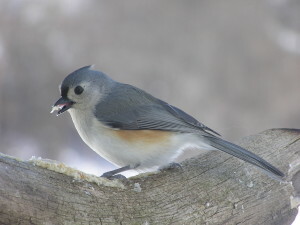 Traditionally, hole reducers are placed on Titmice nests after the eggs are laid, but in some cases, they have been successfully added prior to egg-laying in cases of severe harassment by Bluebirds. 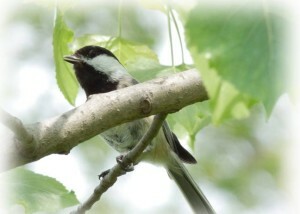 Chickadees, like Titmice, are very desirable nestbox tenants. 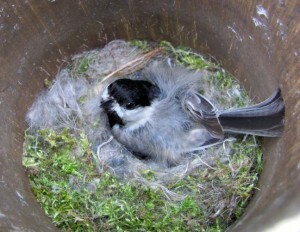 Never interfere with a Chickadee nesting! If Bluebirds and Chickadees are fighting over the same box, try putting up a second box on your property a little distance away from the Bluebird box, and use a hole reducer to prevent the Bluebirds from harassing the Chickadees. 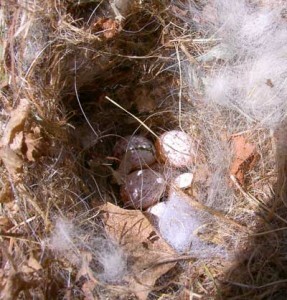 Black-capped Chickadee nest and eggs. 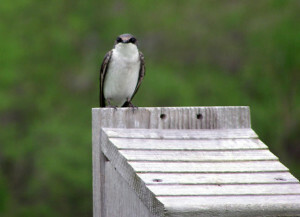 The Tree Swallow (TRES) is a beautiful bird welcomed by many Bluebird nestbox owners. If you have both TRES and Bluebirds, you are doubly blessed! 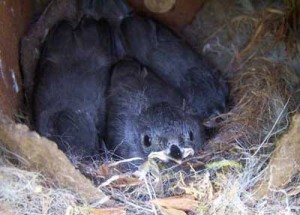 The two species can often be encouraged to nest in close proximity by providing nestboxes in pairs, placed 5 – 25 feet apart. 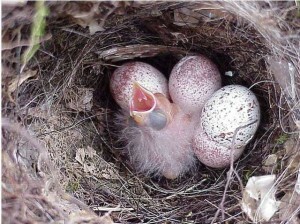 The TRES have just one nesting per season, so often a Bluebird will choose a TRES nestbox for its second or third nesting of the year. 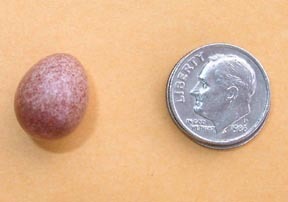 TRES feed by catching insects in the air, and Bluebirds are ground feeders, so they are not competitors for the same food sources. 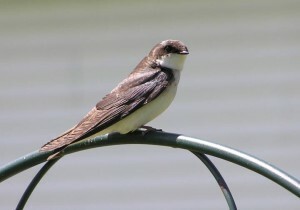 Female Tree Swallow – note the slight brownish tinge on the back feathers. 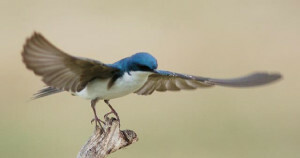 Male Tree Swallow in take-off (Photo courtesy Wendell Long). 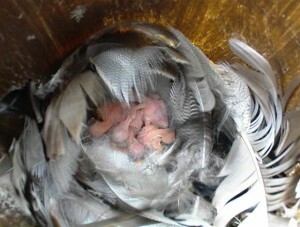 Tree Swallows build beautiful, feather-lined nests. 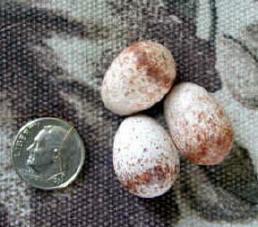 Average 4-6 white eggs. The Carolina Wren is a lovely little songbird that is not known to be aggressive toward Bluebirds. 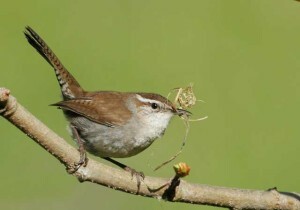 The Bewick’s Wren is another lovely native songbird that is not known to be aggressive towards Bluebirds. 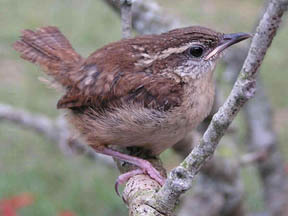 Bewicks Wren (Photo courtesy Tom Grey).